It is difficult to believe how radically different emergency preparedness and response communication was just 20 years ago. There were no real-time databases responders could access, no Facebook notifications or emergency tweets, and no interactive online maps at the public’s disposal. Technological platforms such as smartphones and social media have facilitated innovation in preparedness and resilience and public-private partnerships are seizing the opportunity to use the technology in new ways. Online mapmaking is one such example, as touted in a recent article from The Atlantic. Following the recent devastation of the Philippines by Super Typhoon Haiyan, a form of humanitarian technology emerged, causing widespread implications for future disaster preparedness. 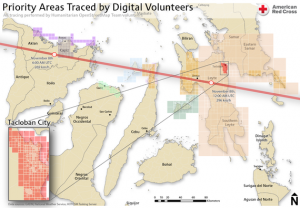 Hundreds of volunteers have contributed to an online map of the Philippines, making distribution paths more navigable for the Red Cross and other organizations throughout the rebuilding process. The map-making program, OpenStreetMap (OSM), currently has more than 1 million users around the globe and features an interface that even the most inexperienced technophobe could navigate. Anyone can create an account and update the map by tracing roads, buildings, and bodies of water. Using the recently uploaded OSM data, aid workers can print the maps, ensuring that they are using an up-to-date representation of the area, rather than an outdated map printed weeks, months, or years prior. Though online mapmaking is not a wholly new technology for disaster relief, this is the first time the Red Cross has coordinated its efforts around the tool. The private sector can also play a crucial and often unexpected role following a disaster. When Craig Fugate became FEMA Administrator in 2009, he brought with him a unique directory he used while serving as Florida’s emergency management chief – the Waffle Index. Because Waffle Houses operate 24 hours a day, seven days a week, Fugate found they are a good indicator of how accessible electricity, gas, and roads are during major disasters. The 1,700 Waffle House locations (shown in the map above) are also all located in areas on the Gulf Coast, East Coast, and Midwest—areas prone to hurricanes and tornadoes. With its own fleet of generators, a mobile command center to assist in disaster recovery, and employee crisis training programs, Waffle House is a superb example of a private sector industry maintaining a strong handle on emergency preparedness while collaborating with the public sector to ensure safety during a crisis.